A portion of my exposure to Australian Equities is held with Vanguard Investments Australia in the form of the Vanguard Index Australian Shares Fund. This fund distributes income on the 31 December and so it takes a few days for the distribution to be declared and the unit price to adjust. I can’t close out my year until this occurs. I monitor the value of the Retirement Investing Today Low Charge Portfolio on a weekly basis rolling up the values every Saturday. This means for me my year actually started at the market close on the 06 January 2012 and finished on the market close on the 04 January 2013. My personal investing strategy is now aligned around the mantra – Save Hard, Invest Wisely, Retire Early so let’s review my year around those 6 short words. 5% was used by my better half to ensure both our early retirement ambitions stay in sync. Therefore this money didn’t make it into my Invest Wisely but are still family savings so I’ve chosen to include them. Year end score: Conceded Pass. The amount saved was nowhere enough for Early Retirement Extreme however it should still be plenty for a nice Early Retirement. My plan for next year is to get that savings rate back up to 60%. 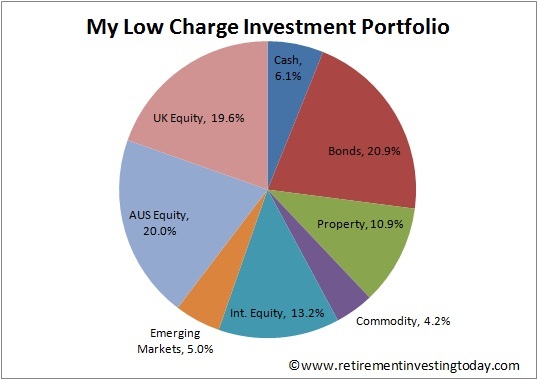 I have continued with the Retirement Investing Today Low Charge Strategy. My asset allocations at year end are shown in the chart below. 12.6% held within ISA Wrappers. 100% of which is invested within the TD Trading ISA. I continue to use TD Direct Investing as the Investments I hold within the ISA, plus the fact that I have over £5,100 with TD means I have no annual fees to pay. This helps ensure I minimise fees and taxes and not just taxes. Year end score: Pass. Sure I am only 69.1% tax efficiently invested but I have at least maximised the opportunities made available to me in the year while ensuring I maintain my risk profile. I have continued to relentlessly look to drive expenses out of my portfolio. I have posted numerous times on the damage expenses can do to a portfolio. This year I have driven portfolio expenses down from 0.40% to 0.36%. That may not sound like much but to me it’s a reduction in fees of 10% while also ensuring I don’t expose myself to unnecessary taxes in the hunt for fee minimisation. If one is Investing Wisely then they should be able to beat (or at least match if you are 100% Index Tracking, which IMHO is an admirable pursuit) an Index Benchmark. For me that Benchmark is a simple UK Equity and Bond Portfolio aligned in percentage terms with the building blocks of my own portfolio which is then rebalanced once every year. Today that benchmark allocation is 69% UK Equities and 31% UK. The 2 indices I use to replicate that benchmark are the FTSE 100 Total Return (Capital & Income) Index which this year has returned 12.0% and the iBoxx® Sterling Liquid Corporate Long-Dated Bond Total Return (Capital & Income) Index which has returned 11.7%. The return of my benchmark (69% x 12.0% + 31% x 11.7%) is therefore 11.9%. In contrast my portfolio has provided a total return of 13.5% beating my benchmark comfortably. This is a true return which allows for the fact that large levels of contributions are being made throughout the year. Year end score: Distinction. Not only have I beaten my benchmark comfortably but my portfolio sees some costs that the benchmark doesn’t. This includes fund and wrapper expenses, withholding tax on some investments and savings interest tax deducted at source meaning even more true outperformance than declared if we were comparing apples with apples. I’m happy to have beaten my benchmark over 2012 however if I’m not generating good long term returns then it’s all meaningless as this is a long game. 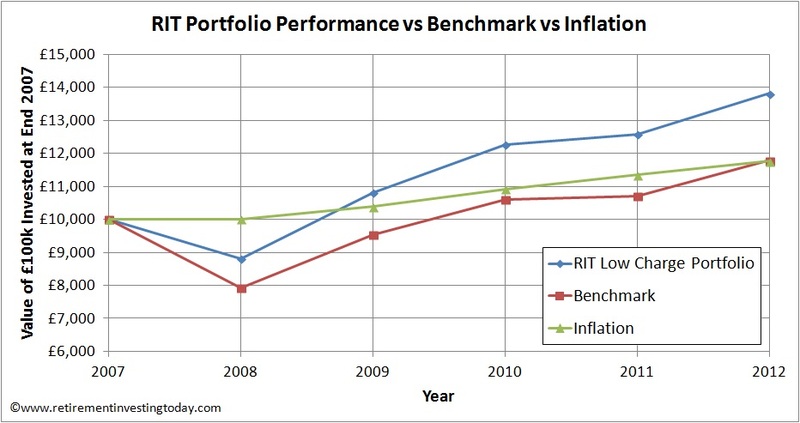 I started my investment tracking in 2007 and so can show how my portfolio has compared against the benchmark and against inflation (RPI) since then. This is shown in the chart below. Note that the chart assumes a starting sum of £10,000. This is not my portfolio balance at that time but is instead simply a nominal chosen sum to demonstrate performance. I never reveal my portfolio values in £ terms because frankly it’s irrelevant to readers as we all have different earnings, investments, risk profiles, savings profiles and target retirement amounts. Since then end of 2007 the benchmark has only kept pace with inflation. In contrast my portfolio has increased at a Compound Annual Growth Rate (CAGR) of 6.7%. In real inflation adjusted returns that’s a return of 3.4%. If I am to achieve Early Retirement in less than 4 years and then maintain that spending power throughout retirement I need to be securing a real 4% return (which is a common rule of thumb in the personal finance world) year in year out. Year end score: Fail. I’ve comfortably beaten my benchmark and inflation but have not achieved my target. I’m not going to make any adjustments to my planned total return yet because I’m fully aware that the period includes part of the Global Financial Crisis. I can’t rest on this statement though because I also know that it includes the subsequent recovery period. When I started this site in November 2009 I stated that my aim was to retire (which I define as work becoming optional) in less than 7 years. We are now 3 years on and I’m now stating that my aim is to retire in less than 4 years. I’d call that on track. My progress to retirement is now 65.2%. Year end score: Pass. My strategy of Saving Hard and Investing Wisely still has me heading in the right direction. My improvement point for this year is to get my savings rate back up to that magic 60% of earnings. How did you do over 2012? Are you happy with achievements? RPI for December 2012 is estimated. Thanks, as ever, for a most interesting article. Good to see you are on track to achieve your objectives - roll on 2017 whoo hooo! As you know, my own portfolio consists of investment trusts, individual higher yield shares and a mixed porfolio of PIBS, preference shares and corp. bonds. Equities roughly 60% and FI around 40%. The best total returns over the past year came from FI at 25% (Coventry PIBS 29%). The average overall was 15.5% which is very acceptable. As you say, it is crucial to keep costs down to achieve good returns - your figure of 0.36 is commendable! Looking forward to the next progress report. Congratulations on the 15.5%! A lot better than my 13.5%. As we've discussed previously quite a different approach to me. I share the HYP concept but don't have the Investment Trusts, PIBS, Preference Shares or Corporate Bonds. It's always interesting to see how Retirement Investing Today readers are going about building assets and then maintaining them in retirement. I'd be interested to know what your annual expenses with that portfolio look like. Do you have that data for your total portfolio? "I'd be interested to know what your annual expenses with that portfolio look like. Do you have that data for your total portfolio?" There are no ongoing expenses (after purchase) on both the shares portfolio and the fixed income portfolio - so that is around 2/3rds of the total portfolio. The average ongoing charges within the investment trust portfolio are 0.9% (after the initial purchase). My sipp and isa are with Sippdeal so there are no annual charges, however as the sipp has now been converted to drawdown, there is an annual admin fee of £75 +vat but as you would have such costs with any drawdown provider, I don't consider this to be relevant in this context. Therefore, I would say annual ongoing costs would work out 0.3% on the whole portfolio - very similar to your own. Thanks for sharing John. The HYP is one method (similar to yourself) that I'm also using to get the costs down in my own portfolio. "100% of which is invested within the TD Trading ISA. I continue to use TD Direct Investing as the Investments I hold within the ISA, plus the fact that I have over £5,100 with TD means I have no annual fees to pay"
I see on one of the finance websites today that TD Direct are now introducing a charge of 0.35% for holding funds - I have not looked into the exact details but may be worth checking with them? Thanks for giving readers (and me) the heads up. I've so far found TD Direct pretty transparent when it comes to fees. Whenever they have proposed a change they've always sent me an email and I'm yet to be affected by any of them. Maybe it's just luck. I struggle to understand what TD are up to with this charging structure. It appears that if you buy low cost trackers, which is what I'm all about, then the 0.35% doesn't apply. It's almost as though they want to actively encourage the low cost tracker fraternity to come their way. Are they thinking that companies like Vanguard are about to put a big dent in the active fund management industry and they want those customers. The question is how will they make money from it? Could they be trying to attract everyone, which will then be followed by a small charge at a later date, much like H-L introduced. That's possibly just me being cynical which in the years I've been with TD doesn't seem to be their method of operation. Only time will tell but I'll be watching carefully. Either way I appear to be ok for now as I only hold ETF/ETC's within my TD ISA from iShares and ETF Securities which don't seem to be affected. 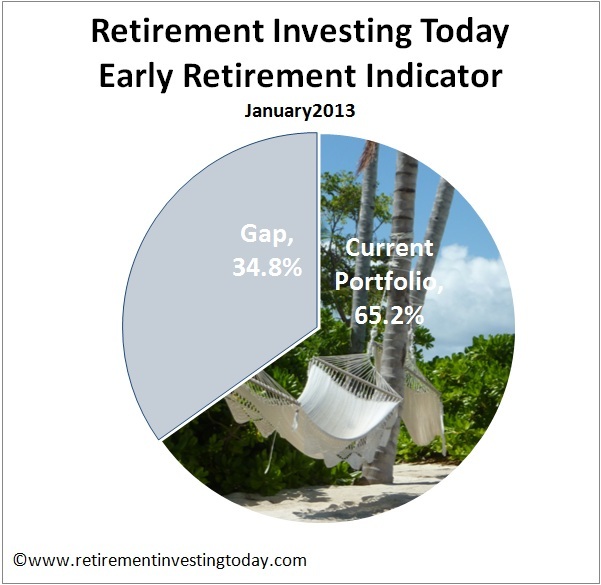 One other aspect I was wondering about - I see you are almost 2/3 of the way to your target of early retirement. My question is how do you set the target goal - is it a specific figure and if so, how do you know the income that can be generated will be adequate to replace existing income? Maybe you have already covered this, in which case a link would be appreciated. I have answered this question a few times in post Comments but I don’t think I’ve ever posted about it. Back in 2007 I worked out what “earnings” would enable me to live the lifestyle I want in retirement. This was a number in the £’s of the day. At the same time I worked out what real (inflation adjusted) return I believed my investment strategy could deliver both during the accrual stage and the drawdown stage including allowing for a bit of a risk adjustment. These calculations were done based on not intending to draw down on capital in retirement and capital maintaining pace with inflation. This made the maths easier but it also meant the number required became larger. By dividing the earnings by the real drawdown return I was able to see a scarily big number. It was that big number that forced me into the frugal Save Hard element of my strategy as I realised that without that element I was never going to make a sensible retirement age given the low real return I had assumed I would get during the accrual stage. I now have an Excel sheet that details current and forecast returns based on my datasets and the books that I’ve read. This includes de-risking my portfolio as I age. As all my calculations are done in non-inflation terms I then index those 2007 earnings by the RPI every year to keep my “earnings” target constant. I now just enter all my current asset values weekly plus every so often update my forecast contribution areas based on rebalancing new money into the worst performing asset class and I get a new progress to retirement %. It’s quite a motivator. I guess I don’t know that the income will be adequate to replace existing income. But does anyone? What I do know is that if history is any guide then the amount I expect to withdraw in % terms annually is sufficiently low that we would have to be about to enter a very gloomy future for it to fail. Not sure if I have followed? In 2007, you set a figure which you calculated would provide a reasonable lifestyle - lets say £25,000 p.a. Your target is then set at a very high lump sum of say £700,000 which would be needed to generate the £25K without touching the capital? Is that roughly correct? Would it be a good subject for a future article? Spot on for setting the actual magic number. We'll stay with your example number of £25k. Let's say I've then assumed a safe drawdown percentage of 3.5%. This percentage is calculated based on the assets I expect to hold in retirement and is designed to give myself the best chance of not touching the capital while also allowing the capital to grow with inflation. Therefore, if these were my two numbers the amount I'd require would be £25k/3.5%=£714k. It is a good topic for a future post. I'll get my thinking hat on for how best to present it. Congratulations for your blog, great content ! A quick note on the "Save Hard" part of your strategy: saving 60% of your Gross Earning + Employee pension contribution, this is quite a substantial amount (!) when considering for ex the 40% tax band. This should fall close or even beyond the 75% target of Early Retirement Extreme, which I believe uses Net Earning to compute its annual saving objective. When crunching some of my numbers, I have noticed that my tax take on the "Gross Earning + Employee / Employer pension contribution" was in the region of 30%, and living on the remaining 10% does seem difficult, even if I tend to stick to the "frugal" principles. Without entering into too much details which are not relevant, do you think you can detail a bit more how you manage tax take vs savings ? I agree that saving 60% (well 55% in 2012) is a substantial amount. I've had to make significant changes to my lifestyle including adopting a frugal approach to achieve this. It isn't for everyone and it isn't easy. That said though I feel my life is better for it. Note though that I never say people should save 60%. Everyones salary, lifestyle, commitments and goals are different. All I'm saying is that the number needs to be significant and not 5 or 10% if one is to achieve retire early. Please remember that I'm salary sacrificing 32%, which is more than half of the savings, into my Pension (2012) which is then not taxed. That makes a significant difference but I'm the first to acknowledge that of course it will be taxed on the way back out someday. I hope when that time comes around for me that the lower tax band is still 20%. - Let's say I earn £53,000 and my employer contributes £2,000 to my pension. Therefore my Gross Earning + Employee/Employer Pension Contribution is £55,000. - 32% of that goes straight to Pension which is £17,600. Therefore my gross salary is now £37,400. - Tax and NI on that gross salary is £9,436 which leaves me £27,964. - I then save into ISA's and other Investments 23% of £55,000 which is £12,650. This then leaves me with £27,964-£12,650=£15,314 to live off. - So I have £1,276 to live off per month or £294.5 per week. Assuming a 37.5 hour week that's £7.85 which is still a long way above the National Minimum Wage of £6.19 which would reduce to an effective £5.51 after tax. Does that answer the question? I ask because I'm not sure of your maths which makes me think I may have misunderstood your question. To be losing 30% of your earnings (gross + pension) to tax means you have to be earning a lot of money. It struck me to see the massive impact that a large pension contribution can make. Back to the fictitious example, with somebody who decides not too contribute to his company's pension plan (no employer contribution) or any other pension plan. His gross salary is £53,000 and his tax take will be £15,481 (Tax + NI), and this is 29% of his gross salary. - Left: £8,369 (16%) - This is roughly half the amount compared to your example with a large pension contribution. Also, the savings / net salary reaches in this case a whopping 78% ( = 29,150 / (53,000 - 15,481) ). I do personally contribute to a pension plan, but to a much lesser extend. The main reason is because the savings in the pension pot cannot produce any income before a certain age (50 at the moment, who knows what is going to happen later on...); and I am not sure that I can cover my needs from other sources in the case I decide that "my work is optional". I don't see taxes when withdrawing from the pension pot as a big issue as income stream coming from savings (apart from those in tax shelters) will be taxed anyway. I may be wrong. I supposed you can't have it both ways! It's an interesting point we've hit upon. The amount you choose to sacrifice to Pension under the metric we've defined makes a big difference to the savings percentage number. - Do you want to salary sacrifice just 40% tax amounts or are you happy to sacrifice 20% amounts as well. I can't think of a lot of reasons to sacrifice 20% but I'm sure there are some. - What risk do you think there is of the government changing the Pension rules and what might those changes be. - What is the period you have to survive in "retirement" between stopping paid work and being able to access your pension. This is the point you mentioned. You mention you can access your pension at 50. Can I ask what country you are resident in or alterntaively do you have an "old special" plan because it is my understanding that I can't access my personal pension until age 55. Ah, my mistake then; I am currently resident in the UK, with no access to pension before 55 as you rightly indicated. This is what happens when you move between countries and you have to understand the subtle differences between systems! In France for ex, it is possible to access pension funds before the retirement age (not sure what that is) under several very specific conditions, like for ex, when you want to buy a house! You still pay taxes when you move your funds out, but much less compared to what you would have paid up-front. That being said, voluntary private pension schemes using market supports are not that popular (or was not last time I checked) mainly because state and additional compulsory pension schemes have made a decent work so far to secure substantial income to people. For how long, this remains to be seen. I have not thought of pension salary sacrifice according to tax brackets (your first point), but this is interesting.